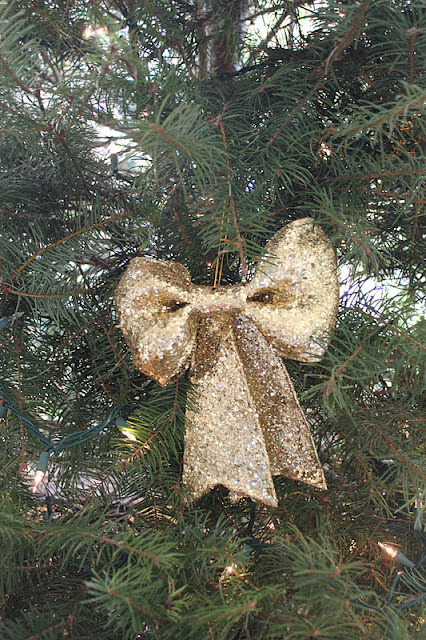 As I said in a past post, I look forward to getting our tree and decorating it beginning in about July. I love the smell, the feel, the childhood memories it brings back. I could go on. I try to make sure that my girls have the same happy memories of this time of year that I do. I have a deep love of France as I lived there briefly and my degree is in the language. I debated about this bow as it is a little over the top. But I really like it! One day I will stop apologizing for my bad photographic skills. Until then I have to fill you in. The paper on the top of the eiffel towel says "wish." 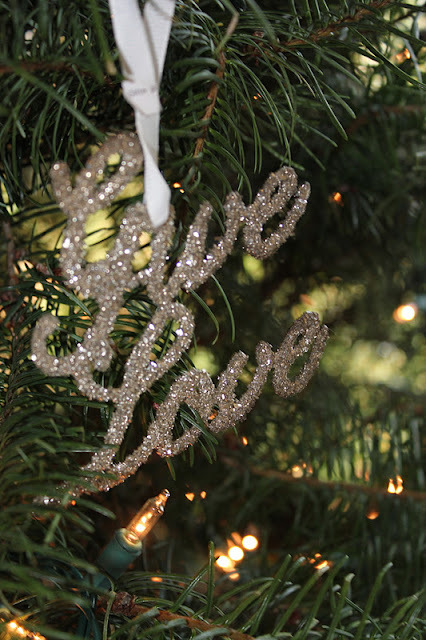 These ornaments are from Pottery Barn and I love them for their sparkle as well as their simple messages. This dragonfly, though small, stands out on a tree because of its uniqueness. I wrap the gifts with brown kraft to keep in the natural and neutral theme. I find eyelet or white trim and add jingle bells or glittery balls. This is my second favorite ornament. I made it out of grain sack fabric for a friend of mine. I wrote on a small piece of paper my wish for her for 2012 and enclosed it in the heart before sewing it up. 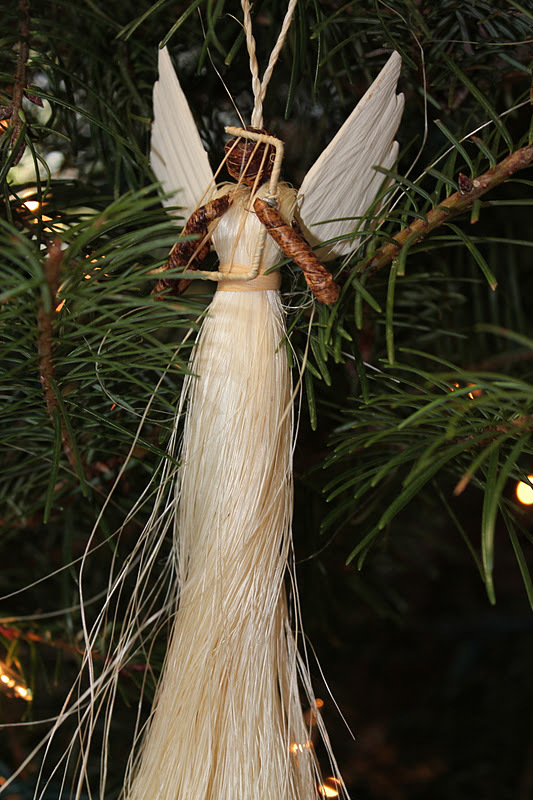 And finally the ornament I hold the dearest is this angel. About five years ago I had my first Christmas tree that I had had in a very long time. And my friend knew that I had no ornaments. She showed up with a box of about three of them to start my collection. I have two of these angels and hope to pass them on to my two girls one day. Thank you for making this, my first year, of blogging a pleasure. Your kind words always encourage me and warm my heart. 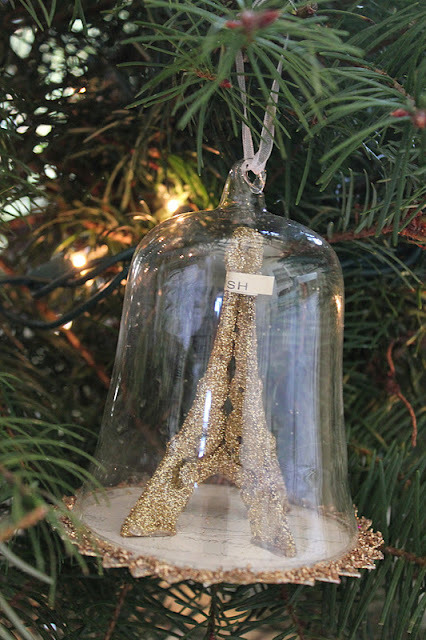 Your tree is a beautiful and enchanting gallery of keepsakes and sentiments! I too, love the fragrance when we bring in the evergreens! Michele, I read and blog with my pillow almost every night. It defines the look of our living room! I wish you and your dear daughters Merry Christmas Blessings! I was so excited to see that you had posted!! 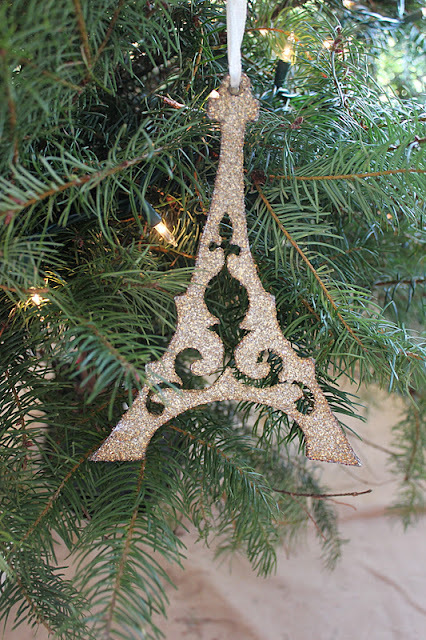 I love all of your ornaments, anything that glitters and represents Paris always makes me happy!! And I absolutely adore the way you wrapped all of the presents, it's so beautiful!! Thank you for your sweet comment on my post today, I sincerely appreciate it! I hope you and your girls have a wonderful and joyous Christmas! Hello Michele, Thank-you so much for the sweet comment on my blog! And I love your tree with all the beautiful glitter ornaments. I am sure when it is lighted it just sparkles! Thank-you too for those amazing pillows, I can't tell you enough how much I love them. I even did a small feature of them in my post 12 More Days. I know I will be back to your store for more amazing linens soon! Just found your blog. Love the craft paper wrapping. I do the same as I can use it for any occasion. Just did a post about making gift tags from luggage tags. Love your design aesthetic and what you are doing to your rental kitchen!